Sankosha finishing equipment is widely recognised as the world leader in supplying the finest quality single buck and double buck shirt finishing systems. Their reliability is second to none which is why they supply their equipment with a 5 year warranty for all welded parts and their microprocessors. Exceptional productivity is maintained with the highest possible quality produced shirt after shirt, without the need for additional ironing. Training on new equipment for shirt finishing is achieved in only a few hours with superb results produced time after time. The Sankosha LP580E is the latest in a very long line of successful single buck shirt machines produced by Sankosha. The LP580E comes as standard with many of the tried and tested features that has made Sankosha so popular. Capable of 60 shirts per hour and up to 2,500 shirts per week offering an excellent finish with minimal touch up. New additional copper coil fitted inside the body to help prevent staining of covers. For the more budget conscious where speed is not a requirement yet are still looking for the quality of production of the Sankosha or for the cleaner that is looking for added flexibility then the Sankosha MF250E-V2 is the industry leader. Offering the ability of processing ladies blouses, polo shirts, T-shirts or larger children’s shirts, this multi garment finisher is one of our best sellers. The Sankosha LP690E-V2 space saving design offers dimensions (WxD) 710x1000mm compared to average dimensions of 1200x1150mm on comparable machinery. 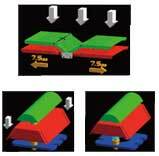 The only collar cuff press to offer tensioning on both the cuffs and collar resulting in a perfect finish. The only collar and cuff press to offer finishing of both short sleeves at the same time as the collar is pressed. Upon any shrinkage of the non button placket on centre of shirts the Sankosha LP690E-V2 can ‘stretch’ the placket back to its original shape and length through use of the tensioning functionality of the collar head thus assisting in the perfect finish of the shirt on the LP580E. Unique split bucks and to eliminate gathering on shirt collars and cuffs. Compact design for space saving. Designed for finishing both collar and cuffs in one cycle, with tensioning of up to 10mm on both collar and cuff. Because of the compact design this machine is also able to finish short sleeves. The unique collar tensioning also allows for the stretching of the front placket of the shirt. Two hand control for operator safety start, Third party hand safety bar for central steam supply. 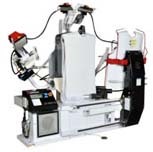 With a capability of 120 shirts per hour or up to 5,000 shirts per week at the top end of the market for production, Parrisianne can supply the Sankosha LP190E tensioning double buck body and sleeve unit with offering a capability of 120 shirts per hour or up to 5,000 shirts per week. With many of the smae feature as the LP580 including a shoulder press specifically designed to provide the best possible press in that hard to finish area. Steam Injection - A new steam injection system covers the entire body width and with a new heated buck body, processing time is reduced. Tensioning Tuck Press: A new lower tuck clamp has been installed along with a tensioning function improving the tuck finish quality. New larger pressing head improving finish on side panels to support the Improved side expanders that open earlier to eliminate wrinkles. Designed for finishing both collar and cuffs in one cycle, with tensioning of up to 10mm on both collar and cuff, featuring a New higher angle on the cuffs accommodates smaller women’s blouses and fashion shirt cuffs and New built in vacuum reduces drying time and increases production. The unique collar tensioning feature will eliminate wrinkles out of collars and also allows for the stretching of the front placket of the shirt. Capable of finishing 2 shirts whilst two others are being unloaded and loaded this allows sufficient production to supply either FOUR x LP570E single buck presses or TWO x LP-185E double buck press or quite simply 200+ shirts per hour.